In San Francisco, bay is a big thing. You’re sitting by the dock of the bay, or dreaming about bay windows fronting fairy floss coloured houses. If you're feeling hungry you can take a trip across the bay to Chez Panisse for the duck legs braised with white wine, green olives and bay leaf. Laurus nobilis. Image via Wikimedia Commons. The bay tree – Laurus nobilis – is also known as sweet bay and bay laurel. It hails from the Mediterranean, and carries a history and mythology almost as heady as its perfume. The noble bay grows as woody tree or shrub and it leaves are dark and leathery, ruffling slightly along the edges. From Classical times the laurel wreath has been a symbol of victory. Starting in the 770s BC laurel wreaths were awarded to the victors of the athletic contests that were the forerunners of the Olympic Games. Never a group to rest on its laurels (yep, the saying had its origins here too), politicians quickly warmed to the vote-winning potential of the victory wreath. Gaius Julius Caesar was crowned with laurel for the bravery of his fighting in Asia Minor. Some suggest he took to wearing a crown quite frequently and enthusiastically thereafter. Leaping ahead a few centuries, Napoleon Bonparte adopted the laurel wreath as part of his brand strategy, having himself crowned with an actual gold wreath and ordering the production of coins featuring his wreath-bedecked head. 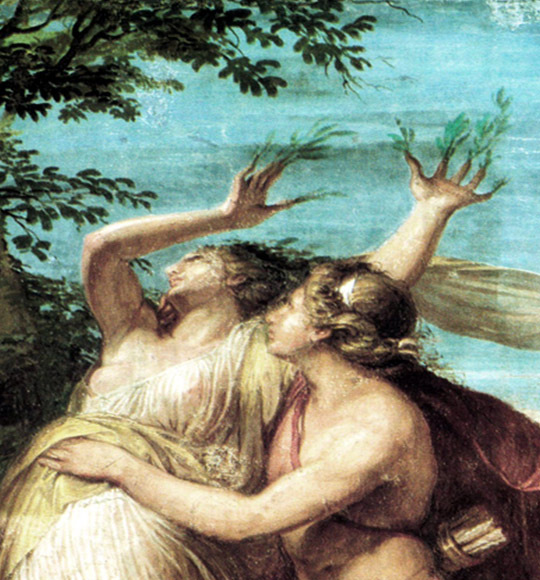 Detail from Apollo and Daphne, by Andrea Appiani circa 1795-1800, via Wikimedia Commons. The early laurel wreaths were created and given in honour of Apollo. Apollo, the god of light and poetry, was the son of Zeus, and he developed quite a thing for Daphne, a beautiful mortal. This was unfortunate in many regards, chiefly because Daphne did not share his feelings. Undeterred, Apollo pursued Daphne, until finally she asked her father to intercede. He transformed her into a laurel tree - thanks Dad – leaving Apollo heartbroken. To remember her he took the laurel as the symbol for poets: the poet laureate is therefore one who is signified by the laurel wreath. Dante, he of the inferno, is often depicted wearing a wreath of laurel. For those less in need of crowns, the bay tree is most admired for its aromatic leaves. The bay leaf is a key ingredient of the bouquet garni. Along with parsley and thyme this twined bundle of herbs is used to flavour stocks, soups and sauces. Bay leaf is also the key ingredient in Queen Mab’s Pudding. This 17th century English dish of creamy custard scented with bay leaf and laced with dried fruit is named after a fairy mentioned in a speech by Mercutio in Shakespeare’s Romeo and Juliet. In case you were wondering. 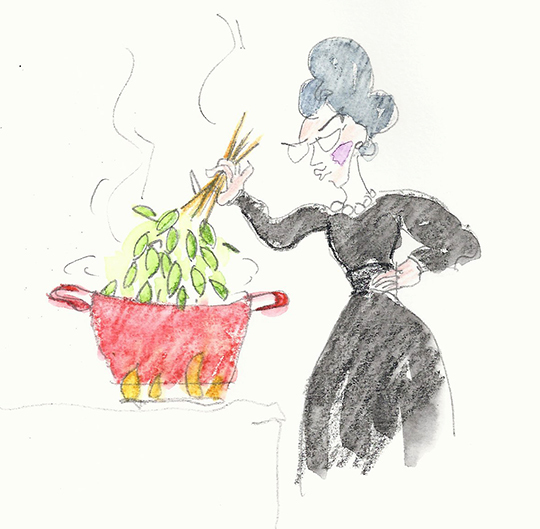 On the savoury side of the meal, this recipe for Laurel-Leaf Soup was given by Picasso’s muse and lover Dora Maar to Alice B. Toklas, the longtime partner of Gertrude Stein and a renowned cook, hostess and writer. Toklas describes this as “an invigorating soup”, and I have no doubt it is. Most homes today know bay leaves in the dried form, but the flavour is stronger in fresh leaves. Being able to pluck a fresh leaf at will is a pleasure, and bays are so easy to grow it’s surprising they don’t feature in gardens more often. Bay trees are tough and versatile. They can be grown as big trees, hedging or topiary specimens, or in pots, and they're supremely drought tolerant. Brisbane gardeners keen to try can check with local nurseries or make the trip down to Mudgeereeba to this place. My own bay tree - a gift - endures almost criminal level of neglect and has more scales than a conservatorium of music. Despite this it cheerfully continues to produce thick strong leaves. For that alone it deserves to be crowned with the laurel wreath of victory. According to The Witchipedia (a fascinating resource about which I was desperately unaware prior to researching this article) "bay leaves may be added to any spell or potion designed to enhance psychic ability and is [sic] a great addition to a psychic dream pillow."